Each month I review a new book for ImageUpdate. Here’s the latest. Before the concentration camps, Yitzhak Goldah was an accomplished young journalist in Prague. Inside the camps, he nearly died at the hands of Nazi scientists. 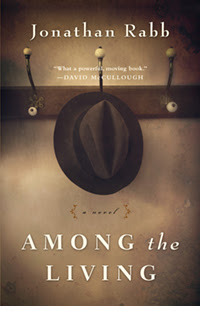 But after the camps, Yitzhak Goldah is still alive, and this is where Jonathan Rabb’s novel Among the Living begins: Goldah stepping into his new life in Savannah, Georgia, with his American cousins, Abe and Pearl Jesler. The Jeslers have decided everything: He will work at Abe’s shoe store; he will use a new name (“Ike Goldah. That’s good and strong”); he will submit to Pearl’s over-attentive mothering… or, as it turns out, to the reader’s delight, perhaps he won’t. What keeps this memorable story rushing forward (besides the clear prose and confident plotting) is not so much what’s been done to Goldah, but what Goldah does now that he is free. The members of his new community are forever committing gaffes (Pearl Jesler, closing the drapes: “This room gets far too much sun and just bakes you like an oven”). But these slips of the tongue bother Goldah far less than the pity, the gossip, and the built-in social strata of Savannah: chasms between the Conservative and Reform Jewish communities and between blacks and whites. It isn’t lost on Goldah that U.S. laws and social conventions minimize the humanity of African-Americans, just as the Nazis did to Jews and so many others. But even faced with centuries-old structures like these, Goldah dares to deviate from them when life presents him with new joys: romantic love (even if taboo), meaningful work (even if risky), a place of his own (even if it offends family), and, every step of the way, the very ability to feel. Early on in the book, an American rabbi tells Goldah: “Know that you are among Jews again, Mr. Goldah. Jews who are alive and who are living.” But for Yitzhak Goldah, being fully alive requires even more than that. In the Savannah of 1947—and the wherever-you-are of 2016—certain expectations rule the day. In this worthy novel, Goldah comes alive by flouting those expectations, in favor of a life that he can claim with integrity as his own.